As we had hoped, the rainfall this winter is turning the desert into a virtual carpet of green. 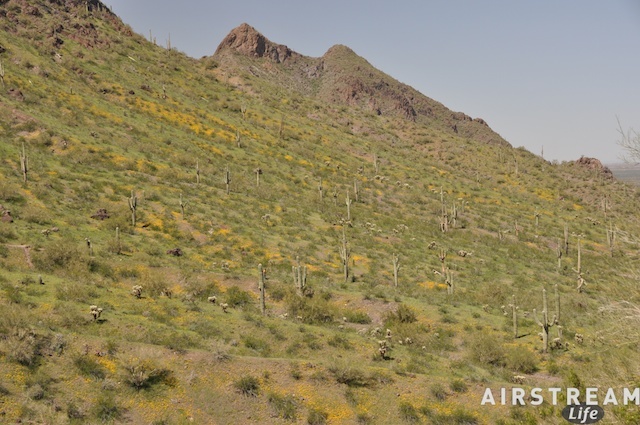 Little yellow flowers are lining the hillside with long yellow streaks punctuated by tall saguaro cactus. Once your eye focuses on the details, you can see blue lupine (?) everywhere, and tiny white flowers just now budding in the shadows beneath taller plants. After a morning of pancakes out by the Fabers’ Bambi, I collected all the excuses for why nobody wanted to do the full hike to the top of Picacho Peak. No matter—there is a shorter, easy hike (0.7 miles) up to a low saddle with an excellent view that almost everyone was able to do. Eleanor stayed behind to do battle with that virus, but Emma, Craig, Ken, Petey, Rick, and Mike all came along. Even for folks over 70 years of age, and those with questionable knees, the hike was easy thanks to plenty of photo stops along the way. I mentioned yesterday that this was an official Tin Can Tourists event. We were surprised to get visits from other TCT members who had read about it in the newsletter and decided to drop in on Saturday afternoon, just to see what was up. Three guys with a 1960s Silver Streak motorhome swung by, and another guy came by with a custom hot rod. We also had a visit from a nice couple who left their converted GMC bus at home. If we organize more TCT events in the future I’m sure we’ll get a chance to see that bus. That’s motivation for me right there—I love to see the buses. The TCT crowd is an exceptionally nice and diverse group of people, which makes camping with them a really great experience. There’s always something to talk about and stories to hear. That probably explains why we never did get away from the campground for that Dairy Queen Blizzard … but in the evening there was the traditional campfire (courtesy of Rick and Judy’s wood) and birthday pie in honor of Eleanor. Too bad she was back in the trailer snoozing again. We’ll do her birthday again later this week when she can properly enjoy it. The Caravel test has been a success. Yes, it’s very small and we have to work around each other to function in the trailer. But it still works as well as it did the last time we camped in it five years ago. Better, actually, since it no longer leaks or smells funny. The larger refrigerator is more usable, the beds are more comfortable, and we’ve learned in the intervening years how to pack it properly so we can actually fit what we need. I was really wondering if we’d come out of this weekend planning to sell it. Instead, we’ve got a plan to go camping again in two weeks up in the Chiricahua Mountains, where the national forest campgrounds are too small for our 30-foot Airstream. The phenomenon that passes for winter in southern Arizona has ended, and that means it is prime camping season down here in the desert southwest. So, a few weeks ago I extended an invitation to the Tin Can Tourists to join us at Picacho Peak State Park for this weekend. Besides the flowers and the imminent doom of the parks, I wanted to climb the dizzying Picacho Peak one more time and hopefully bring Eleanor and Emma up too. We also wanted to camp in the Caravel for the first time as a family since 2005. Alas, reality stepped in, in the form of a virus. Two weeks ago we went to a karate tournament, where Emma picked up two 3rd place medals and both she and I picked up a souvenir case of food poisoning (we think) and a cold virus. We spent the next two days unpleasantly — I’ll spare you the details — and the following week going through what turned out to be a particularly tough cold. A week later we were both entering the final grim stage of borderline sinusitis and then of course Eleanor got it and the routine started over again. So we arrived at Picacho Peak yesterday afternoon with Eleanor in a fairly limp and weakened state, and me with a distinct lack of breath that made it clear I would not be leading a hike up the mountain. Well, despite all that the park is looking fine. 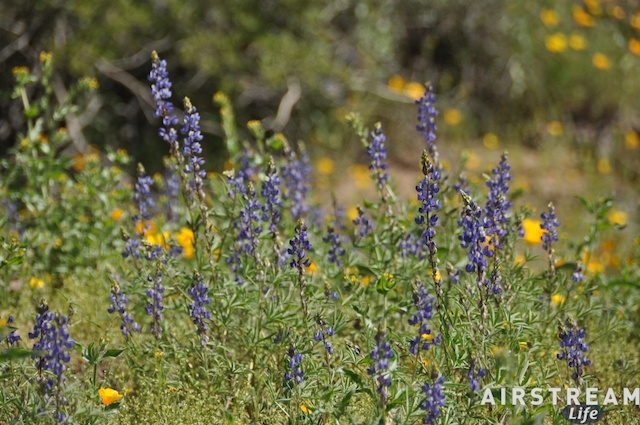 There are little yellow flowers everywhere, as well as a blue flower that looks sort of like a cross between a bluebonnet or lupine. I’m not strong on flower identification, but it’s all pretty, so who cares? The bloom is definitely not at peak yet, and it would be well worth anyone’s time to come visit the park over the next couple of months. 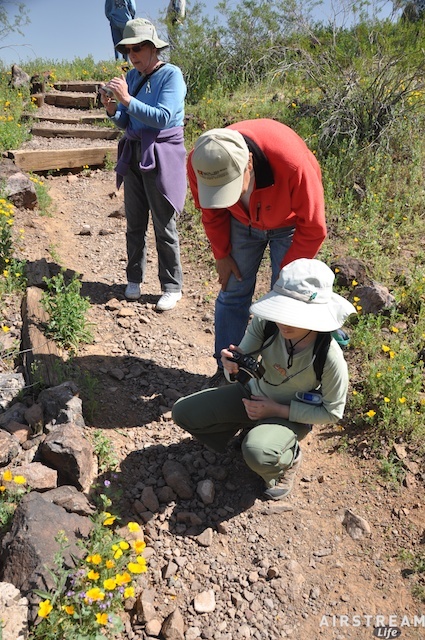 By June, the flowers will be in decline and the park itself will be closed. We have six rigs here: ourselves in the 17 foot 1968 Airstream Caravel; our friends Ken & Petey Faber in their latest project (a 1961 Airstream Bambi, 16 feet of cuteness); Betty in her kit-build teardrop; Craig in his 1969 Newell motorhome; Judy & Rick in their late 80’s Airstream Sovereign 23; and Mike & Rosemary in their late-model Airstream. Some friends of Betty’s are also here in another teardrop trailer. Nobody seems to be planning to hike to the summit. We are the youngest in the crowd, and everyone else has an excuse involving knees, lungs, viruses, or a strong commitment to a sedentary lifestyle. I think if I went today I would be quite alone. So instead we brought two cans of Batter Blaster and a pair of griddles, and we will be making pancakes for all at 8:30. After that, we shall let the day unfold as it will. There is “nothing” to do here except hike, take pictures, socialize, explore the new visitor center, picnic, make campfires, paint (as Petey is doing in her Bambi in the photo at right), read trashy novels, take tours of each other’s trailers, nap, and make pancakes. Oh, and there’s a Dairy Queen at the rest area a mile away … can you say “Blizzard”? So don’t feel badly for us. Life is good in the desert these days, despite bacterial and virus infections, and we are all pleased to get to try out our baby trailer again. Although I have to admit it doesn’t seem all that small compared to the 16-foot Bambi next door, and the tiny teardrops parked just up the hill. I’ll report further on life in 17 feet later this weekend. Last summer, when we were traveling through Minnesota we parked the Airstream overnight in front of a private home (by prior arrangement) and spent the evening meeting the owners over dinner on their patio. The homeowner, who was a Mercedes Benz enthusiast, sniffed around our then-new GL320 and later mentioned casually that he himself would never buy a new car. I was a little taken aback at his comment since he had a garage full of cars of various vintages, and others stored offsite. But none of his cars were built in the last decade. He went on to explain that his cars had been bought used, and maintained very well so that they were still in excellent running condition. His idea was that a good quality car should be a lifetime investment, but most people look at cars as temporary assets and tend to get rid of them just after they’ve slid down the steepest part of the depreciation curve. Financially, his theory made some sense, if the car is of sufficient quality in the first place, the owner maintains it well, and there are no uncontrollable environmental factors such as road salt destroying the car despite the owner’s best efforts. But those are big “gotchas” and most cars don’t qualify. Many become “money pit” cars, extraordinarily expensive in their later years and which never again — despite massive infusions of cash — become as reliable as they were when they were new. Others are just made to be disposable. It occurred to me that we first got involved with Airstream for the same reason. 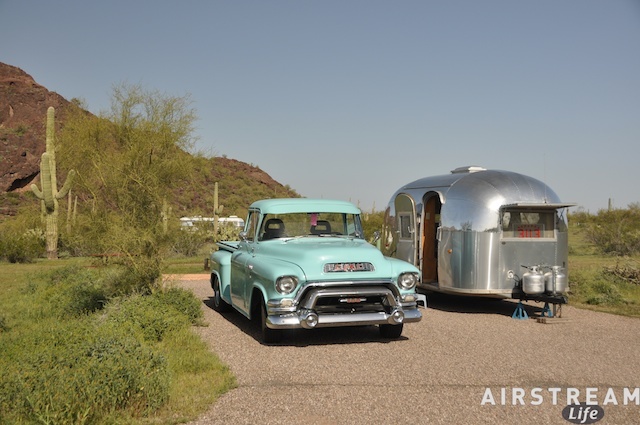 Certainly there were plenty of other brands that would cost half as much for the same amenities and size, but in Airstream we felt we could get a trailer that would last for decades and be worth the investment of maintenance over time. That was an easier choice, because our first Airstream, the 1968 Caravel, was 35 years old when we bought it. It had already proven itself. In fact, Airstreams have proven to be extraordinarily durable over the years. It’s no big deal to go to a vintage Airstream rally and find dozens of trailers still on the road after four, five, even six decades of service. That’s even more impressive because of the relatively low numbers that were made — the survival rate is probably quite a bit higher than any make of car. I think any Airstream can be considered a “lifetime” purchase. The big killers of Airstreams are accidents and water leaks. You can’t do much about accidents, but leaks are often the direct result of owner neglect. 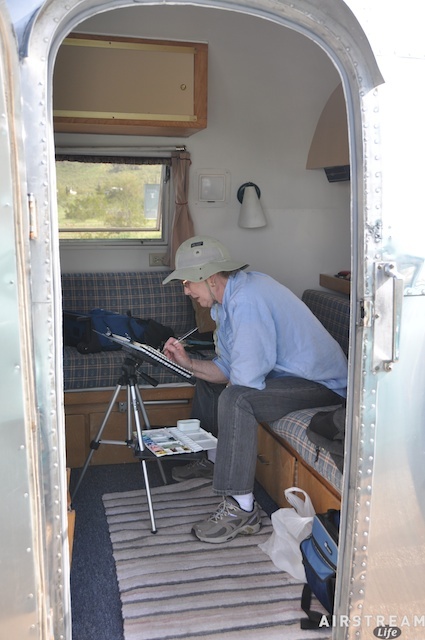 Just by keeping it dry inside, you can expect your Airstream to outlive you. Parts are still readily available for trailers forty years old, so there’s no “planned obsolescence” with an Airstream. With that viewpoint you can start to see how people justify the cost of an Airstream over another brand, despite the oft-heard rantings about cosmetic corrosion on the skin or quality issues. The issues and complaints associated with a less-than-perfect new trailer fall away after a few years of ownership and use. The real payoff comes way down the road, when the white box alternative is falling apart and the Airstream is just getting seasoned. Would you rather have a trailer that looks good and performs well for the first year, or the tenth year? The key, of course, is maintenance. People often ask us what full-timers should budget for maintenance and repairs per year. Our experience was about $2,000 per year. I think that’s not bad at all to keep a rolling home on the road for 365 days of use and 20,000 miles. It’s less than I spent maintaining my previous stationary home. We were and are always aggressive about maintenance. Every year I had the trailer leak-tested. We replaced or fixed anything that broke as soon as possible. We reinforced those things that proved to be under-designed. We inspected the less-accessible spots routinely (underbelly, under cabinets, inside storage compartments, etc.) just to see what might have gone wrong. Ignorance is not bliss when it comes to travel trailers. Serious users know this. But a lot of people don’t want to spend a penny on fixing anything that’s not obviously broken, and the result is that they pay more later to fix what they neglected and/or end up with a trailer that isn’t worth keeping in a few years. The result of diligence and appropriate investment speaks for itself. The 2005 Airstream Safari sits in our carport, absolutely 100% ready to go at any moment. It needs nothing. Four years and probably 80,000 miles of hard use later, everything works exactly as it did the day we bought it (better, in fact, thanks to some upgrades and tweaks). I see no reason that it should deteriorate and be ready for “trade in” anytime. We can keep it forever. Now, to be entirely realistic, there will come a day when a major overhaul is needed. I’m fine with that. We may have missed a tiny leak which is slowly rotting the floor, or maybe the interior will just finally get shabby enough that we decide to do a makeover. But when that day comes, the Airstream will be worth it. It’s a lifetime trailer. An heirloom to pass on, in good condition, to the next generation. 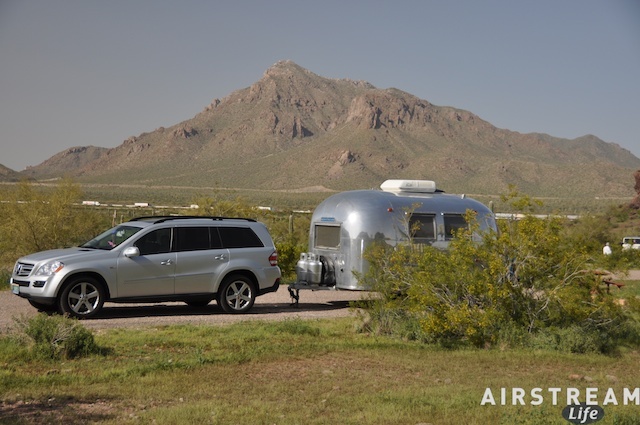 Will the Mercedes be towing the Airstream in ten years? Twenty? I hope so. But if only one of them survives to see its third decade … well, I’m betting on the Airstream. I’ve been getting some pushback from faithful readers of this blog, asking why I haven’t been posting frequently. This is a tough question to answer, but I’ve felt obligated to think it through because writing this blog is part of my regular mental exercise routine. As a writer, just as with many other things, you’ve got to use it or lose it. That was good exercise for a writer, and I had plenty of material in our daily lives as travelers — more, in fact, than I could write about. There were subtexts and intrigues going on in my business and personal life that extended far beyond the travel adventures, and I deliberately suppressed much of that, because (a) it was too much to write about; (b) we were already feeling exposed by the daily blog; and (c) if I wrote the full story of everything we saw and heard, I would have been tied to a stake and burned by now. And now here we are, living in a house that lacks wheels, where the scenery is more or less static (“Look, there’s snow in the mountains today!”), where we are more obliged than before to actively seek out novelty and entertainment because my personality doesn’t do well with the pleasant stay-at-home and quiet-Sunday-reading-the-newspaper mode of life. In short, I am a travel junkie in rehab, and the rehab isn’t going too well. I live for the relapses. In the past couple of months I’ve managed to slip out a few times, on a massive road trip to Michigan and back (December), to Quartzsite for a weekend, a round-robin through southern California in January, and separate trips in February to Scottsdale for the annual car auctions, and Palm Springs for Modernism Week. Between these excursions we try to find interesting events in Tucson to experience, like the Tucson Rodeo, Day of the Dead, and the Gem Show. Bloggers are often both journalists and subjects. They interview themselves more often than they report on the world around, and lately I’ve been finding that my interviews have been rather dull. Reluctant subjects are the worst kind, because they have interesting things to say but are too shy or intimidated to tell the good stuff. But my journalist side can’t convince my subject side to let loose with a good story. Without travel as a regular spur for my thoughts, not much seems to come out. I am not sure if half my brain has suddenly gotten shy or if there’s really nothing interesting going on in there. Things will soon pick up again, travel-wise. It has been an unusually wet and cool winter in Tucson, thanks in part to the El Nino effect that has brought us many storms. 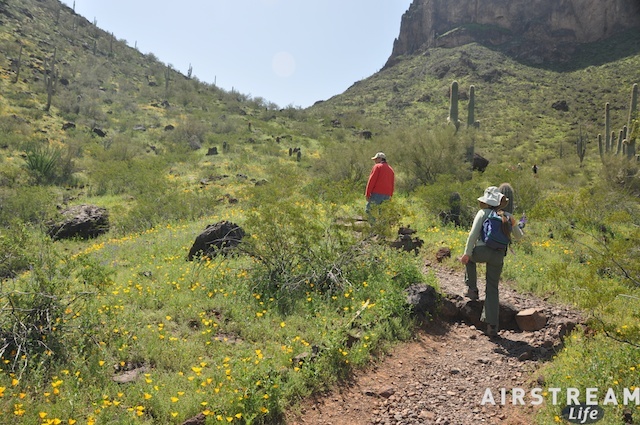 Everyone is expecting an absolutely explosive springtime bloom in the desert, worthy of some trips to Organ Pipe Cactus National Monument, Sierra Vista, and up into our own Santa Catalina mountains. Bert Gildart called today from his base at Anza-Borrego Desert State Park (California) to report that already they are seeing a lot of flowers in the lower Colorado Desert. We should start spotting flowers on the prickly pears here soon, as well as gorgeous red flowers on ocotillo and many others besides. Once the weather starts to warm up to beach temperatures, we plan to take the Caravel on a family weekend somewhere. I’m also thinking of inviting the local Tin Can Tourists members to join us for a “vintage camping weekend” somewhere in southern Arizona. No big deal, just a little campout where those who have vintage trailers would be encouraged to bring them. Of course, anyone who wants to come and have a nice weekend with any trailer would be welcome. I’ll ping the 4CU members too, since a lot of them live in Arizona. The dates under consideration are March 26-28, 2010, but we haven’t picked out the spot yet. If you might want to come, let me know. I guess I am addicted to the diversity and novelty that travel brings. Tucson is a great town with lots to do, but getting out and experiencing life beyond is what drives my writing. So if it get quiet here again, just remember that a slump in the blog means only that we are plotting the next adventure.